Yesterday, I started working on a card that used a Color Burst background, but life things happily intervened and I never got it finished. Today was wrap up day for the Watercolour Online Card Class Exploring Mediums and low and behold one of the instructors featured Brusho in her videos. Well Brusho works the same way as Color Burst so I knew I could not only finish my card but also upload it to the class gallery. 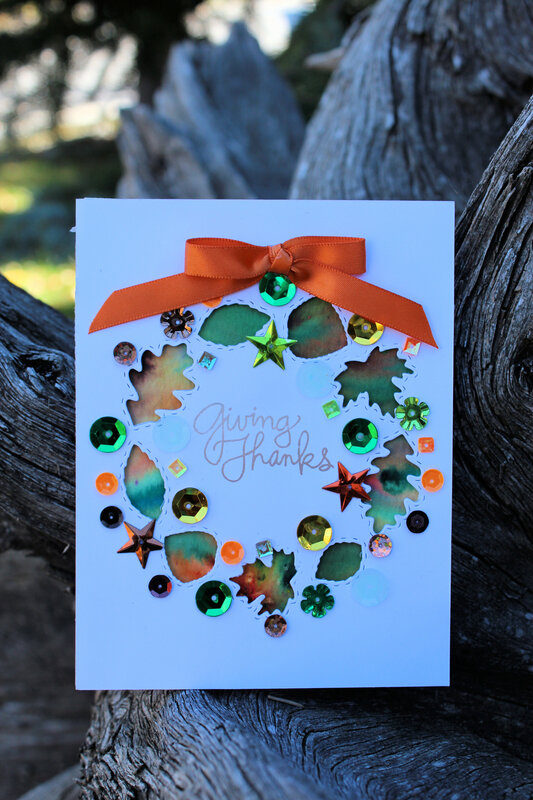 The Color Burst background only appears through the leaf die cut holes, but I think it is vivid enough to still make a statement. Taylored Expressions has a line of stamps called Grumplings. I love them because they express in their images and sentiments exactly what I am feeling sometimes. It occurred to me that I could adapt the dog in a bee costume to the sketch for the challenge. I think it turned out very well. This past weekend, Sandra and I attended The Great Canadian Scrapbook Carnival at the beautiful Spruce Meadows Horse Jumping Facility. While our wallets took a severe beating, we had a wonderful time. 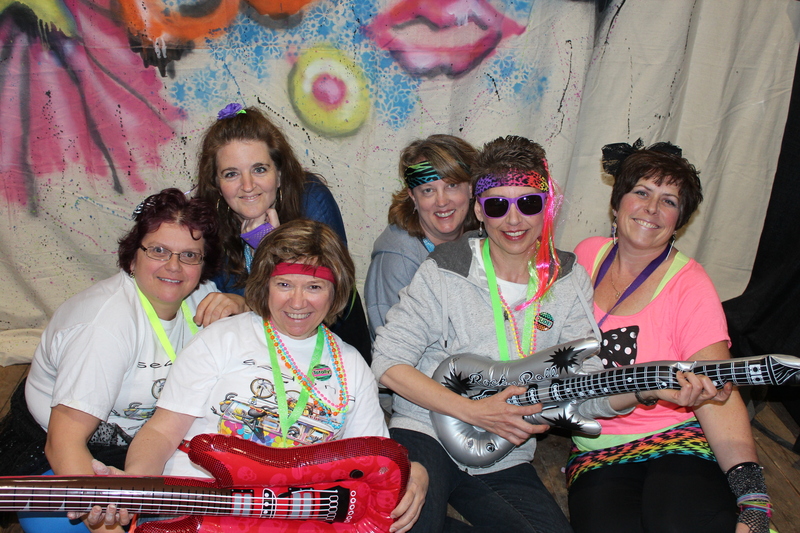 The theme was “the 80″s” so the Crop area was aglow with Neon and Leg Warmers and Big Hair! There was even a prize for the person with the highest bangs. The most amazing thing of all…………………………………..well two most amazing things……………………..is that I actually got quite a few layouts of my recent Alaska Cruise completed……………………and one of my layouts was selected for the Winter Issue of Canadian Scrapbooker. 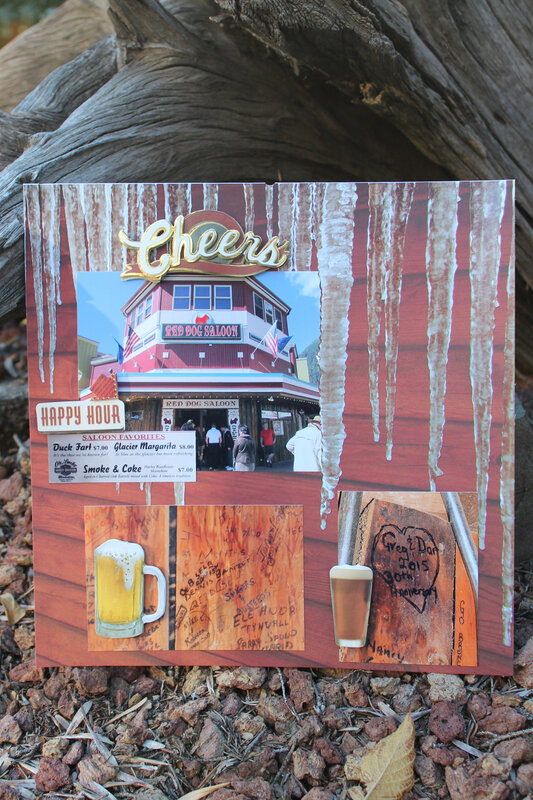 I cannot post this layout until after it is published but below is a layout I did of the Red Dog Saloon, Juneau Alaska. Now the Red Dog really knows how to budget on a shoestring. I should ask them for lessons on how to do this………………hmmm. Anyway, they have saw dust on the floor and the rest of the decor consists of graffiti left by the patrons of the pub. 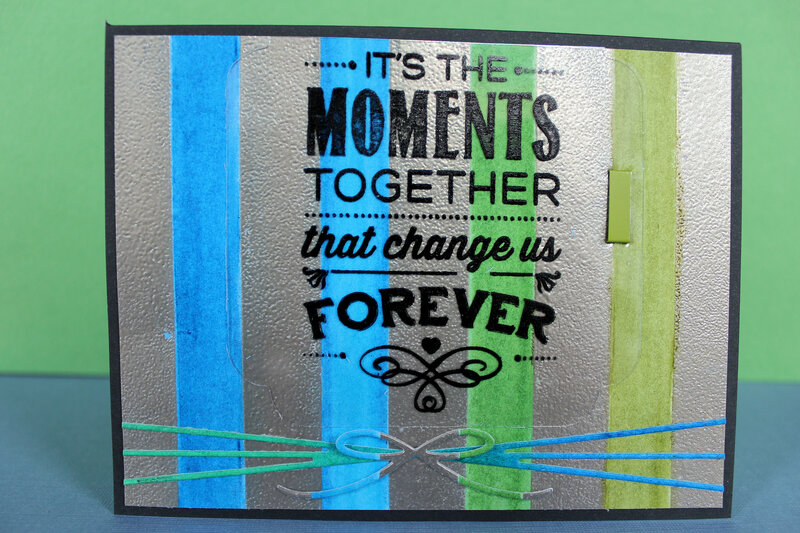 It is everywhere……………walls………tables………….stairs……….bathroom stalls…………..pipes. They also don’t waste much time with customer relations. They just have a big sign that reads, “If our food doesn’t meet your standards……………..lower your standards.” Gotta love it. Well my travel partners and I did our part for the decor by leaving some more graffiti. 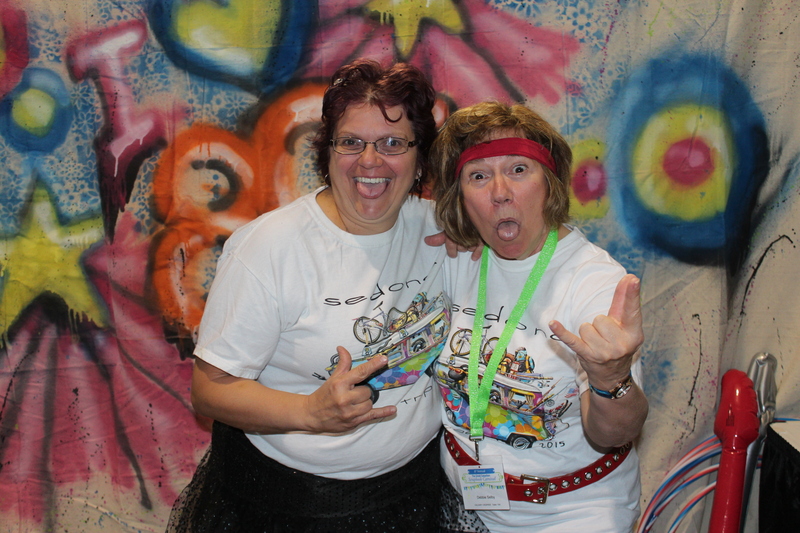 Here is a couple of pictures from the Carnival…………….just because. Third and last day of regular classes for the Online Card Class, Exploring Mediums. Today, the instructors looked at Derwent Watercolour Pencils, Water Soluble Oil Pastels (OMG something I don’t have! ), watercolour crayons and Gelatos. I have to confess I have a love/hate relationship with Gelatos……………mostly hate if the truth be told. I don’t seem to like too much of what I create with them. I am usually happy with the backgrounds I make, it is when I try to spritz and stamp with them that I get the 😦 . Oddly enough, today it was the card and tag done with Gelatos that I liked best. 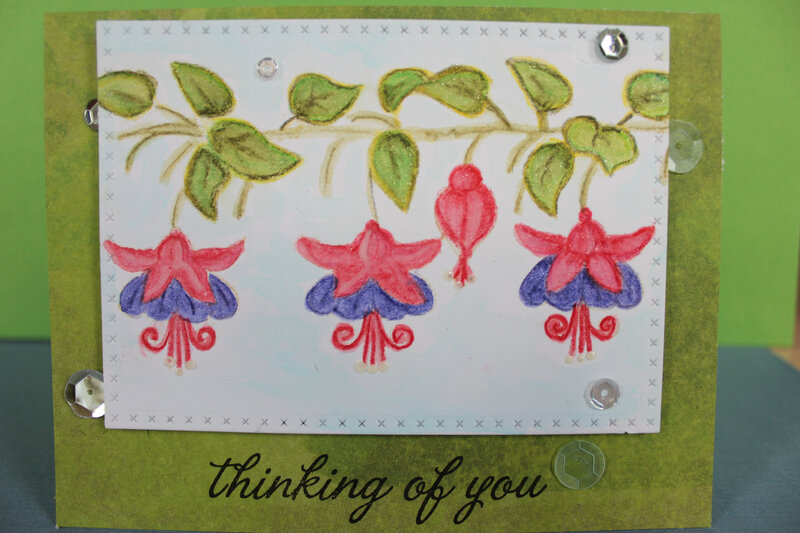 The card of Fuschias done with Derwent Inktense Pencils did not look as nice on paper as in my head. As usual, I did pick up some great tricks and tips that will improve my watercolour skills. This day has been a day from the land down under……………………………and I don’t mean Australia………………..think Dante……………the Inferno………….if you catch my drift. Anyway, I finally got a chance to try one of the lessons from the Online Card Class day 2. I decided to do a watercolour card using Peerless water colours. Peerless watercolours are pretty neat. They have been around for over 100 years and use the same technique of saturating pieces of cardstock with the translucent colour. They even type the instructions in Old English Text. 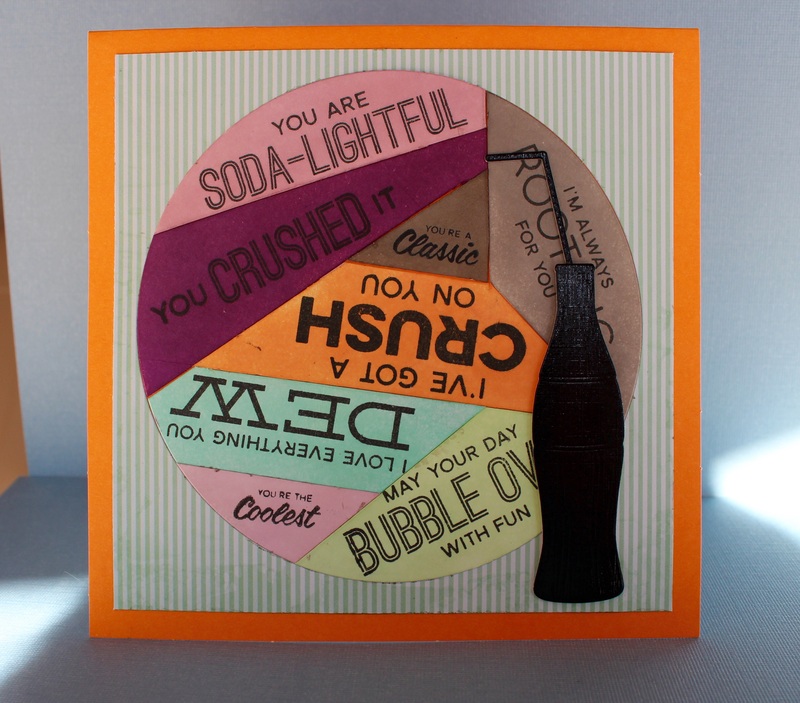 I cut off tiny squares of the cardstock leaflets and put them on a palette and spritz with water. Voila, little pools of lovely colour! 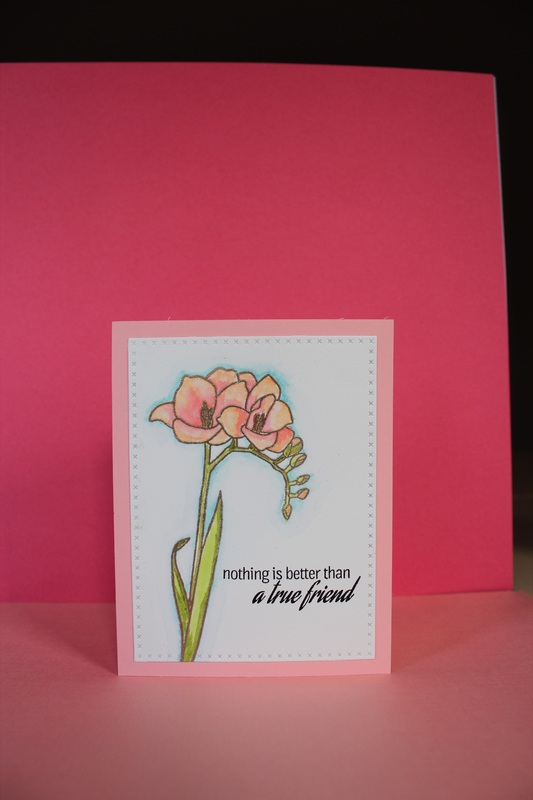 Here is the card I made using some of the tips in today’s class, provided by Dawn Woleslagle of WPlus9 stamp company. 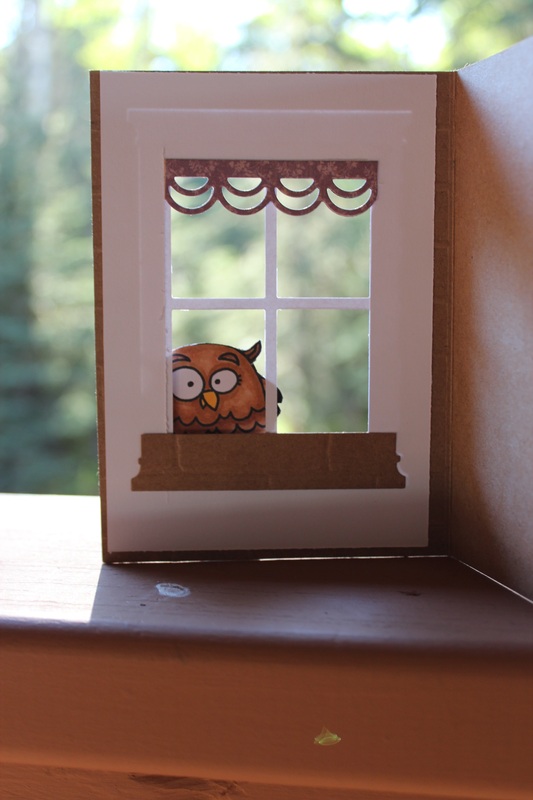 Supplies: Paper Smooches Chubby Chums, Window die Memory Box, Curtain Border Sissix, Stampin Uo brick embossing folder, Recollections and X-press it card stock, Graphic 45 patterned paper, Memento Tuxedo black ink and Copic markers. 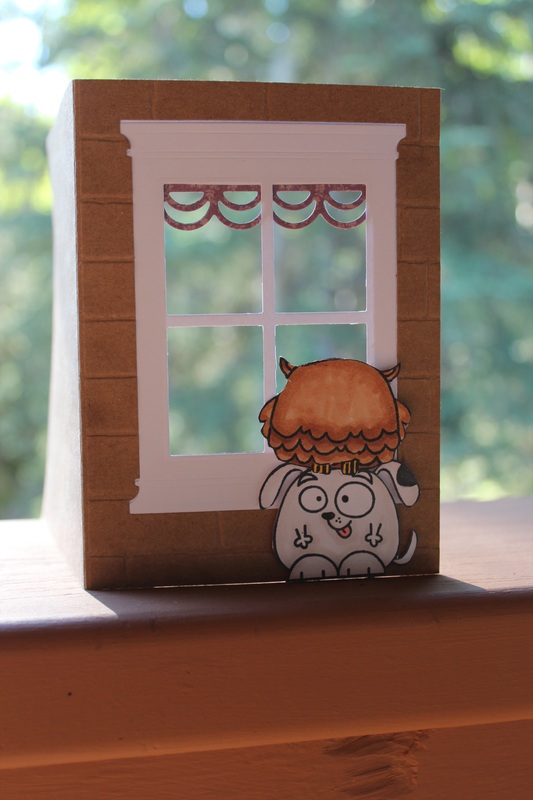 I posted these pictures on the blog and tried to link them to the Paper Smooch Anything Goes Challenge once before but the link failed so I am just trying again. 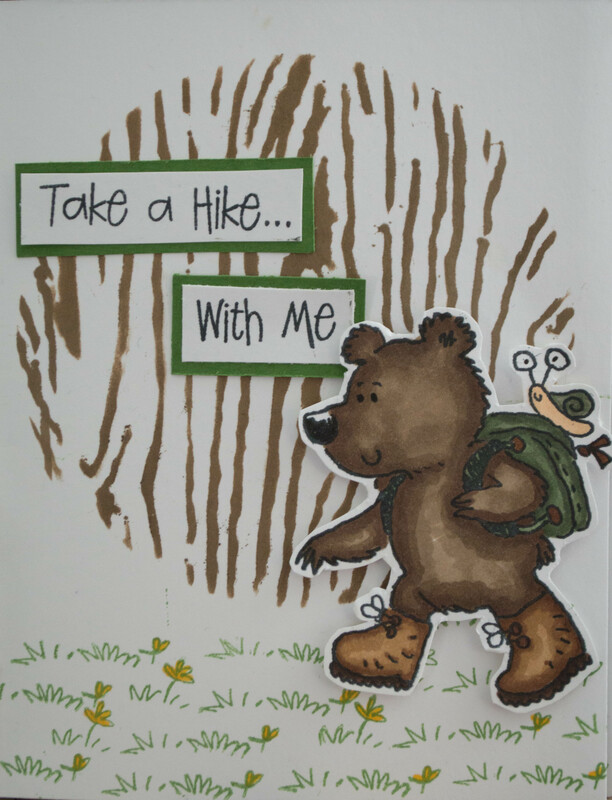 This card comes with a warning though……………………………………….the last time I took a hike with Sandra which was in Zion National Park, she left me to drown in The Narrows while she chased a butterfly! Consider yourself warned!! I am taking the Online Card Class Watercolor exploring Mediums. 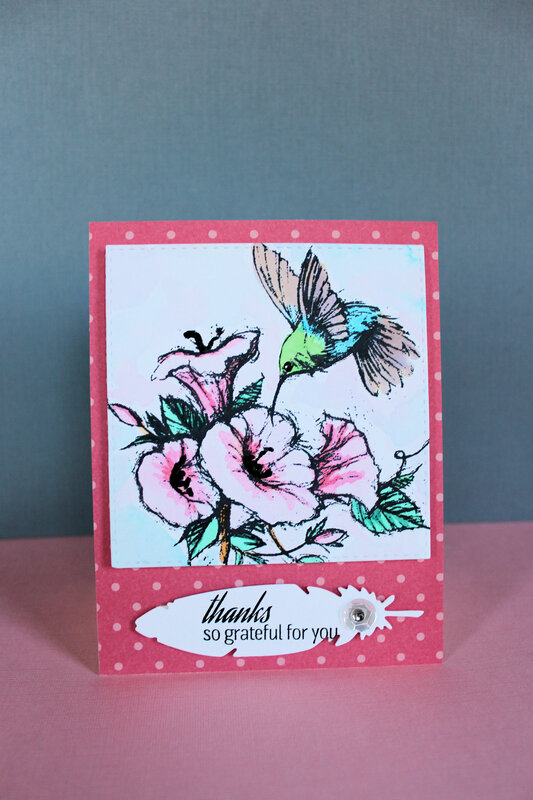 I decided to do a card following Jennifer McGuire’s example of using embossing before watercolouring. I actually made two cards with this method and they both turned out well. On the first one I used liquid masking to do the blue aura around the card but on the second one I just freehanded the blue aura and it turned out fine, as well. 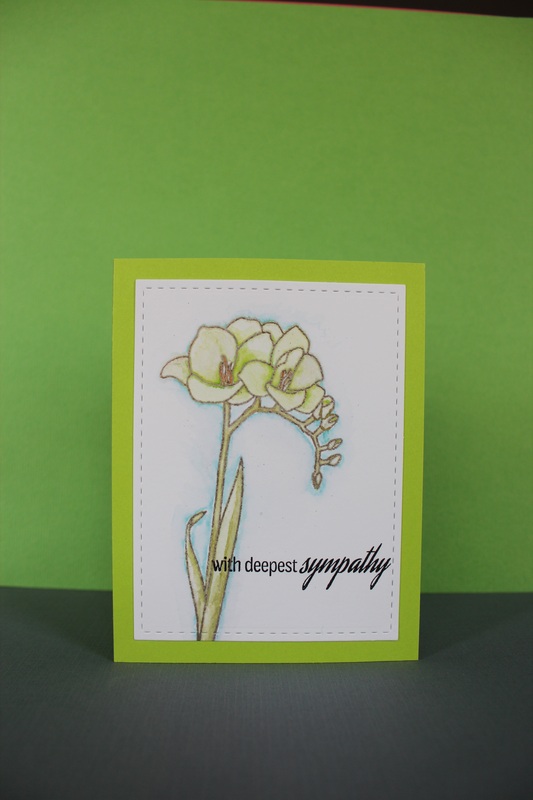 There is something about the uncomplicated light hearted designs of Paper Smooches that gets my creativity flowing. Often, I start out thinking that I will do one thing or use a certain stamp and suddenly an idea occurs to me (wish this would happen to me occasionally in the non-crafting part of my life) and I am off in another direction. Today was just such a day. 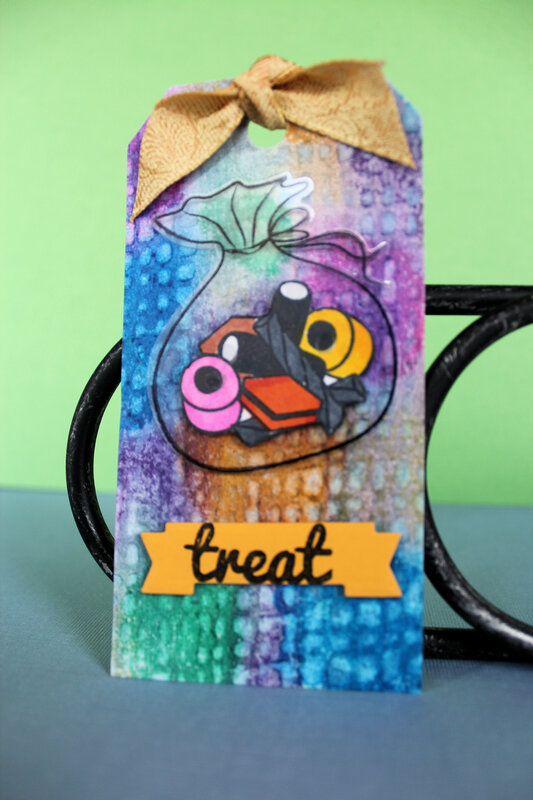 I started out wanting to use The Wise Dies Easel Die to make a simple card for the challenge. When I went to reach for the die, I grabbed the Great Chemistry stamp set instead. That got me to thinking that I could use the easel as a blackboard and write formulas on it. Then I started thinking about what to do for the background and that brought me to think about watercolouring a background since I am taking the Watercolour 2 Online Card Class on Monday. This card would then suit two purposes. 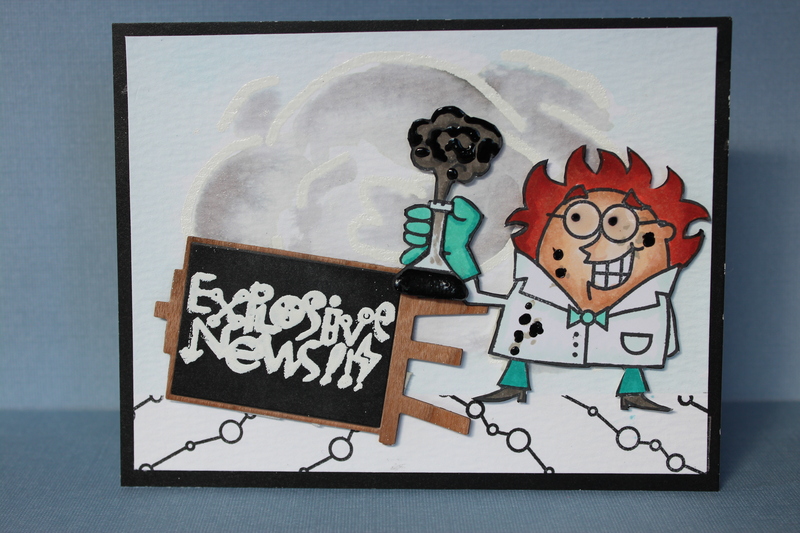 Now of course, it is no longer a simple card with an “explosion” watercolour background, layering, copic colouring and dimensional embellishing, but it was so much fun to make! Supplies: Paper Smooches Great Chemistry stamp set, Paper Smooches Wise Die Easel, Tim Holtz Distress ink refills Hickory Smoke, Recollections white embossing powder, DCWV All Chalked Up cardstock, Memento Tuxedo Black ink, Copic markers, Pico Embellisher in Clear and Black, Scor tape, My Mind’s Eye card base.